AKG K545 headphones part of three-strong new range | What Hi-Fi? We're big fans of AKG headphones, and here at IFA 2013 the company has three key new models: the AKG K323 XS in-ears (from £30), the closed-back/over-ear AKG K545 (£209) – replacing the Award-winning AKG K550 – and the Bluetooth-enabled AKG K845 BT (£249). Perhaps of most interest is the new K545, which builds on the strengths of the K550 and comes in four colours: black, white, black/turquoise and black/orange. The new model is smaller than the old one so it's more suitable for use while out and about. Technical highlights include cushioned earcups around the 5cm drivers and a choice of two cables with a built-in mic for taking and receiving phone calls: one for use with Apple devices with a three-button MFI remote, and a second universal remote for use with Android, Windows Phone and BlackBerry smartphones. The AKG K545 headphones can be folded for easy storage and transportation. If you prefer a wireless rather than wired connection, there's the new AKG K845 BT with NFC (Near Field Communication) Bluetooth connectivity. Volume, pairing and other controls are located on the ear cups and the headphones are powered by a Lithium battery said to give up to eight hours wireless playback. Charging is via a supplied mini-USB-to-USB cable. The AKG K845 BT will be available in black and white from November. Last, but not least, are the AKG K323 XS in-ear headphones. AKG says they're among the "smallest and lightest' models on the market, with 5.8mm drivers. We've seen them, and they're tiny! Three versions are available: a straight cable model (£30, with no mic or remote control); a three-button MFI remote/mic model (£39, in black or white) for use with Apple portables; and a universal remote/mic model (£49) for other smartphones. The latter is available in blue, green, yellow and red. 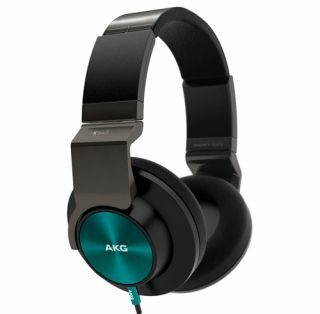 The AKG K545 and K323 XS models are available this month, the K845 BT follows in November.